Since its isolation in 2004 (1), graphene and related materials have attracted tremendous attention for being the base for next generation technologies. We have read in journals and newspaper and heard on the news that this new material will change our world. Graphene sheet. Graphite, graphene transistor and tape dispenser donated to the Nobel Museum in Stockholm by A. Geim and K. Novoselov Credit: Wikipedia Commons. Graphene is a perfect two dimensional (2D) carbon atom sheet. It is the first truly 2D material produced at ambient conditions. Graphene is a hexagonal honeycomb lattice with an average distance between nuclei of two bond atoms of 142 nanometers. In addition, graphene layers stacked on top of each other form graphite with an interplanar distance of around one third of a nanometer. To get a clear picture of the scale, a human hair is approximately 80,000- 100,000 nanometers wide! What makes graphene so interesting? The interest in this material is due to its outstanding electrical, mechanical and chemical properties. It is the lightest material known with a weight of around 0.77 mg per square meter. Graphene is also the strongest material known, 200 times stronger than a sheet of steel with similar thickness. It has a very low Joule effect, which means it heats less than other materials when conducting electrons. Graphene has large electronic mobility at room temperature and ballistic transport, in which electrons simply obey Newton’s second law with no scattering, can cover distances in the range of several micrometers. Its linear dispersion relation at the Dirac point (where the conduction band and the valence band are in contact) makes it an excellent material to study fundamental physics in lab conditions. It is flexible and elastic. It is transparent, with an absorption of just 2.3%. Graphene is a zero-gap semiconductor, with a tunable bandgap. So, after all this amazing characteristics … what if I told you can prepare your own home-made graphene easily and only in one minute? You only need to know where to look for it. Surprisingly, the first graphene kit to isolate this material was as simple as a pencil and a scotch tape (see Figure above). However, this method only allowed to produce small random flakes of graphene (10 micrometers), and, therefore, more complex chemical techniques have been developed. Although the large-area production of pure monolayer graphene was a serious technological hurdle to advance graphene technology, nowadays graphene films in the order of 50cm x 50cm are achievable. At the moment a major challenge that researchers are facing is to develop fast low-cost techniques to pattern graphene at nano-scale, which is necessary for some applications. What are the potential applications of graphene in the next years? Graphene has potential applications in many different fields. Graphene will revolutionize existing products in the fields of electronics and optoelectronics. The creation of graphene-based chips, microprocessors and transistors are duplicating both the current speed and capability in devices that are half-size. However, these products are not yet being produced on a large scale. Outstanding lighting applications will be developed due to its photosensitivity and high conductivity. These properties turn graphene in a top research material for lighting and organic LED applications. Researchers have created a flexible graphene sheet with silver electrodes printed on it (right) that can be used as a touch-screen when connected to control software on a computer (left). Credit: Nature Nanotechnology. Graphene is shaking up the screens industry for devices, smartphones and flexible OLEDs. Indeed, these past two years, the number of patents related to graphene submitted by companies in the sector of screens has increased. Currently, transparent and flexible screens made out of graphene are in the market, so it’s only matter of time that we have flexible watches and smartphones made out of graphene as well. This material has also a great potential as a key component in solar cells, and low cost solar cells made from graphene are almost ready to break into the market. Graphene will have possible applications in other fields such as coatings, batteries and energy storage, automotive industry or rubber and plastics. Abel Gil Villalba has a degree in Physics from Universidad Autónoma de Barcelona as well as Master degrees in Optics and Photonics from the Université Aix-Marseille and the Karlsruhe Institute of Technology. 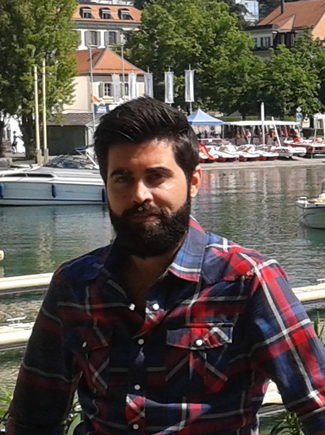 He is currently a PhD student at FEMTO-ST Institute in France, where he works in a project on generation and control of plasma in graphene, and development of new techniques for nanopatterning graphene. This old news…just finding out now? Everyone focuses on electronics benefit of graphene, however how about everyday low technology stuff like replacing steel belts in car tires…flats due to puncture are a thing of the past. Also makes tires more air tight. Used in car windshields to make them scratch proof (as a coating) or more shatter resistant as a replacement for the plastic sandwich that comprises a windshield.